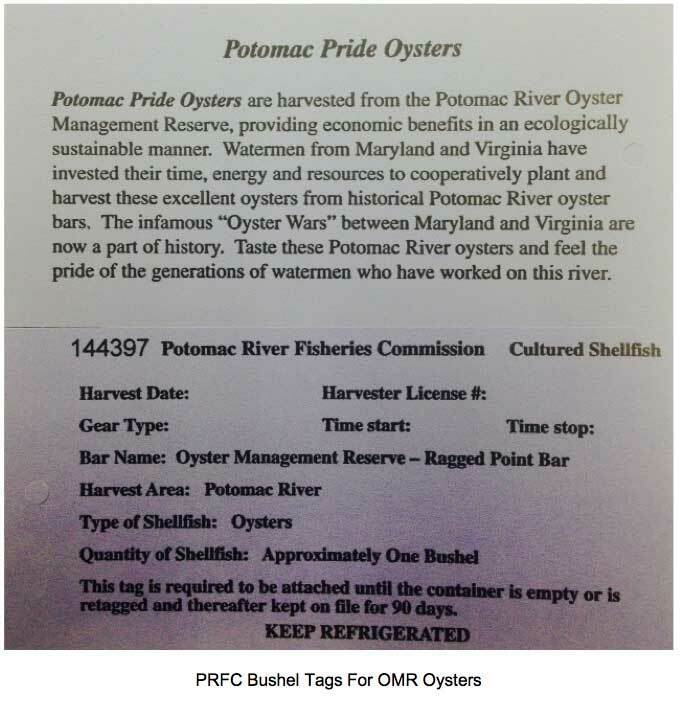 Colonial Beach, VA — The Potomac River Fisheries Commission (PRFC) announced today the opening of its Oyster Management Reserve (OMR) on Ragged Point Oyster Bar in the Potomac River. The OMR Program is a unique program where oysters are planted in a specific area for harvest at a later date and funded by fee paying participants in the program. The “put and take” program was created to be an alternative to the harvest of wild oysters from public oyster grounds in the Potomac River, whose populations have dramatically declined since the early 1990s. The OMR Program uses triploid, native Eastern Oysters, which are unable to reproduce, and channel all of their metabolic energy into growth. As a result, they have the potential to grow in excess of 4” in just two years (see attached image). These larger oysters command an excellent dockside value for the participants. Plantings on the OMR are conducted annually, with harvests two years after each planting. The first planting was conducted in 2012, with the first harvest last year. This year’s harvest is off to a good start with participants reaching their daily limit of 20 bushels per person by 11 AM (see attached image). The timing of the September OMR opening is, by design, intended to allow the participants to take advantage of favorable market conditions in advance of the Chesapeake Bay season which opens on October 1st. The program received start up funding from the Potomac River Fisheries Commission, and is designed to be economically self sustaining with the OMR program participants paying the costs of culturing the oysters, and providing the labor to plant the young oysters on the reserve. John F. “Tucker” Brown is the leader of the OMR Program Committee. Back at the dock this afternoon, he stated: “This is great program. Everyone was very satisfied today. It look’s very promising. The PRFC process was very important in bringing everyone together on both sides of the river to make this program work. The Potomac River is a very important river for oysters, and it has always been a good place to grow them. The results we saw today show it still is." 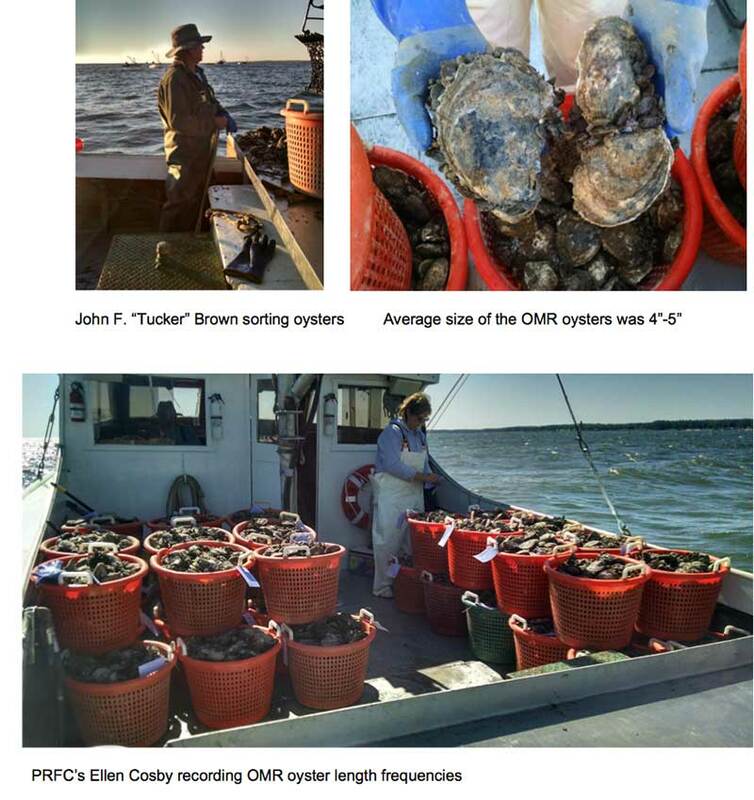 The OMR program’s design and function was created through a broad collaboration of partners, including: the commercial watermen of Maryland and Virginia, Maryland Department of Natural Resources (MD DNR), the Virginia Marine Resources Commission (VMRC) the University of Maryland Center for Estuarine Studies (UMCES), and private hatcheries such as Oyster Seed Holdings LLC and the Ward Oyster Company of Virginia.